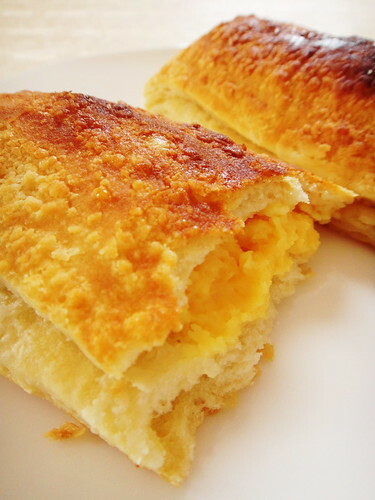 One of the classic french pastries you are sure to find in all boulangeries and pâtisseries in Mauritius, the Feuilleté au Custard is a recipe I have been asked for several times by my fellow readers. 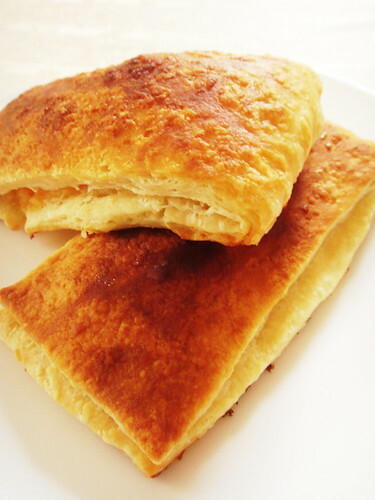 I guess it was sheer laziness that kept me from making pâte feuilletée, the multi-layered puff pastry dough used in several baked goodies like mille-feuilles, pains au chocolat and palmiers. The light and butter-loaded pâte feuilletée may seem to take forever to prepare with all that folding, rolling out and chilling but to achieve those perfect flaky and puffy layers you have to be patient. I think that the best time to try making the time consuming pastry dough is over a free weekend so that you end up with freshly baked feuilletés on the breakfast table a Sunday morning. The secret science that makes them puff up like balloons is pretty straight forward. The water which evaporates from the dough as it bakes gets trapped between the laminated butter and creates giant pockets of steam. This is why it is important to be extra careful during the lamination process. The recipe I chose today is the Daring Bakers January 2007 Challenge where all group members had to make their own puff pastry and shape them into croissants. 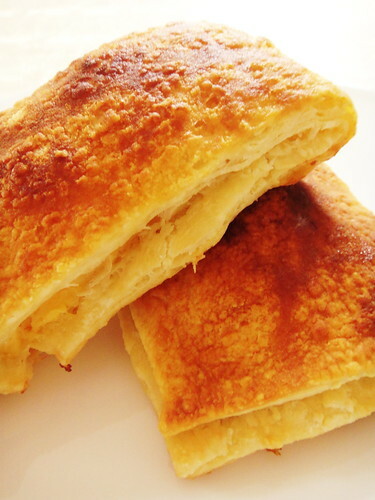 I simply filled them with sweetened custard and bring them to you as feuilletés au custard. In a small saucepan, warm the milk to take the chill off (between 80° to 90 °F). Pour the milk into a mixing bowl, sprinkle the yeast over the milk. Stir to dissolve the yeast with a wooden spoon, and then add the flour. 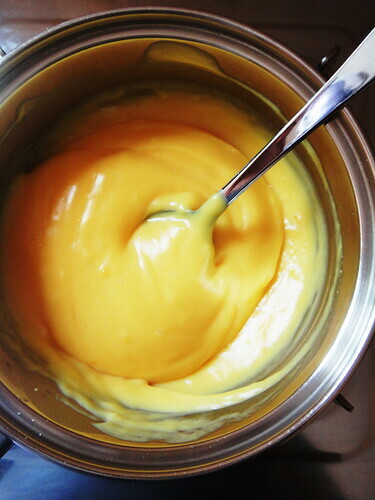 Mix with a wooden spoon until a smooth batter forms. It will almost double in volume for 2 to 3 hours at moderate temperature. First measure out all your ingredients and keep them near at hand. 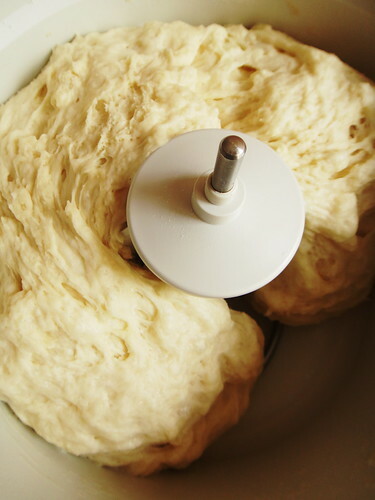 Transfer the starter and then the yeast to the large bowl of a stand mixer fitted with the dough hook. 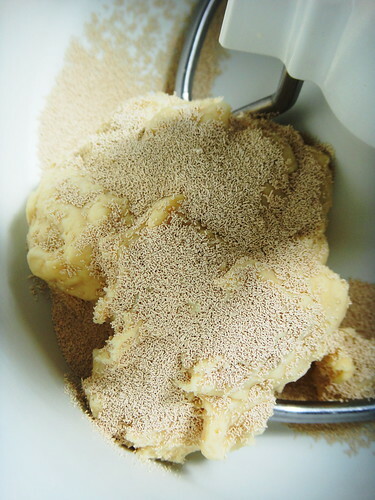 Mix on low speed until the yeast is incorporated into the starter batter, which will take a minute or two. Stop the mixer as needed and use a spatula to clean the bottom and sides of the bowl. Fold the loosened portion into the mixture to incorporate all the elements fully. When the mixture has come together into an even, well-mixed mass, increase the speed to medium. Mix for a couple of minutes. Slowly add half of the milk and continue to mix until the milk is fully incorporated. Reduce the speed to low, add the flour, sugar, salt, melted butter, and the rest of the milk. Mix until the mass comes together in a loose dough, about 3 minutes. 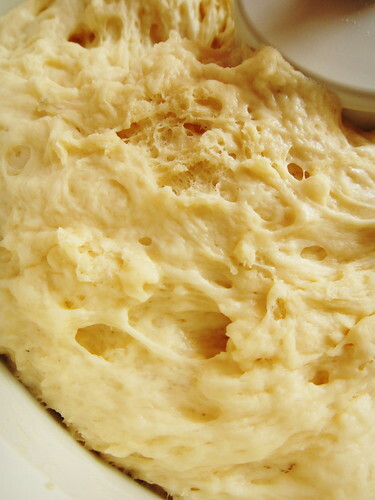 Leave the dough rest for 15 to 20 minutes. This resting period helps to shorten the final mixing phase, which comes next. 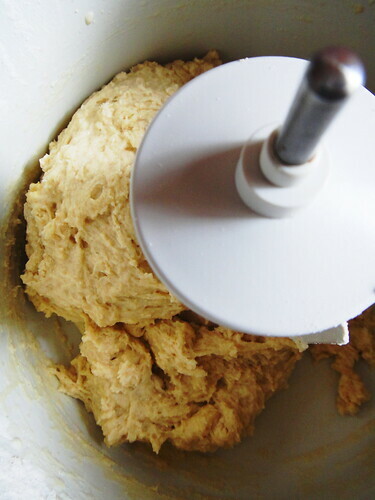 Engage the mixer again on low speed and mix until the dough is smooth and elastic, a maximum of 4 minutes. If the dough is very firm, add a little milk, 1 tablespoon at a time. Take care not to overmix the dough. Cover the bowl with cheesecloth and let the dough rise in a cool place until the volume increases by half, about 1-½ hours. Lightly flour a work surface. Transfer the dough to the floured surface and press into a rectangle 2 inches thick. Wrap the rectangle in plastic wrap. 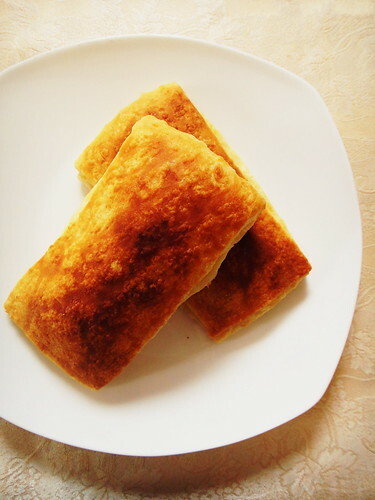 Place the dough in the refrigerator to chill for 4 to 6 hours. 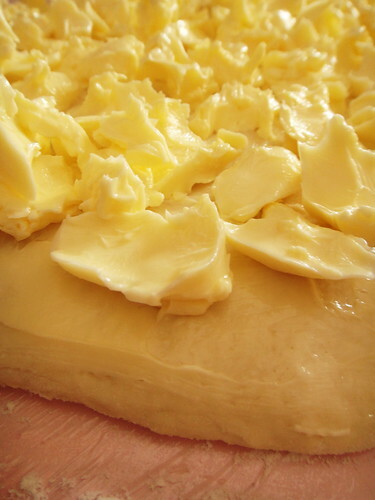 About 1 hour before you are ready to start laminating the dough, remove butter from refrigerator to soften. Put the butter that you will be rolling into the dough in the bowl of the mixer fitted with the paddle attachment. Mix on medium speed until malleable but not warm or soft, about 3 minutes. 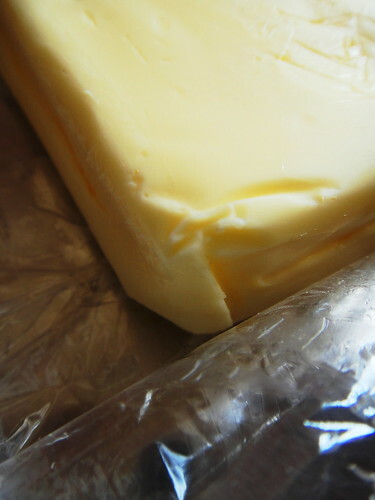 Remove the butter from the bowl, wrap in plastic wrap, and place in the refrigerator to chill but not resolidify. Lightly dust a cool work surface, and then remove the chilled dough and the butter from the refrigerator. Unwrap the dough and place it on the floured surface. Roll out the dough into a rectangle 28 by 12 inches. With the long side of the rectangle facing you, starting from the left side, spread butter over two-thirds the length of the rectangle. Fold the uncovered third over the butter and then fold the left-hand third over the center, as if folding a business letter. Give the plaque a quarter turn so the seams are to your right and left, rather than at the top and bottom. 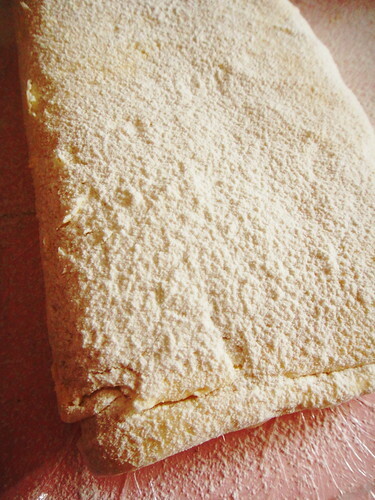 Again, roll out the dough into a rectangle 28 by 12 inches, and fold again in the same manner. With your fingers, push down along the seams on the top and the bottom to seal in the plaque. Wrap in plastic wrap and place in the refrigerator for 1 ½ to 2 hours to relax the gluten in the dough before the third turn. Remove dough from refrigerator. Place on the floured surface, and again roll out into a rectangle 28 by 12 inches. Fold into thirds in the same manner. You should have a plaque of dough measuring about 9 by 12 inches and 1 ½ to 2 inches thick. Wrap in plastic wrap, place on a quarter sheet pan, and immediately place in the freezer to chill for at least 1 hour. 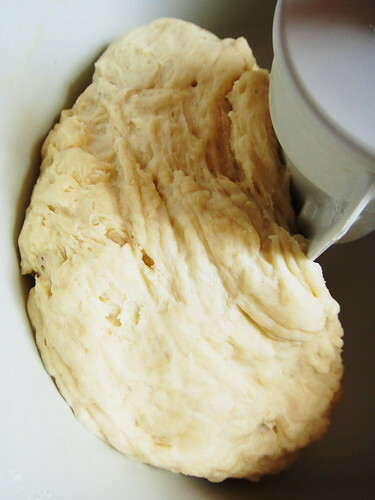 You can leave the dough in the freezer for up to 1 week; remember to transfer it to the refrigerator to thaw overnight before using. For the filling, combine all ingredients over medium heat in a small saucepan until it thickens to coat the back of a spoon. Remove from heat and leave to cool to room temperature. Cover with cling film to prevent skin from forming on surface. Roll out the dough into a rectangle 32 by 12 inches and 3/8 inches thick on a lightly dusted work surface. Cut the rectancgle into neat strips, each measuring 3 by 12 inch, using a pizza wheel or chef’s knife. 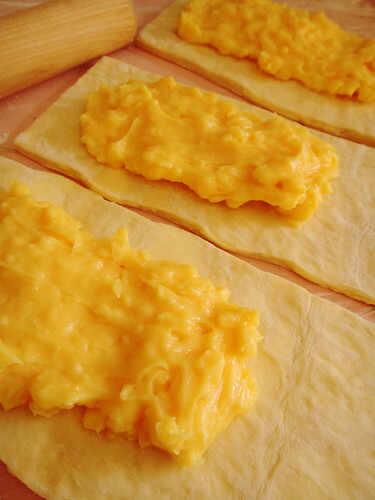 Spread 1 tbs of custard filling over half of each strip. Fold in half and pinch the seams closed with fingers. Line a half sheet pan (about 13 by 18 inches) with parchment paper and place feuilletés on the prepared pan. 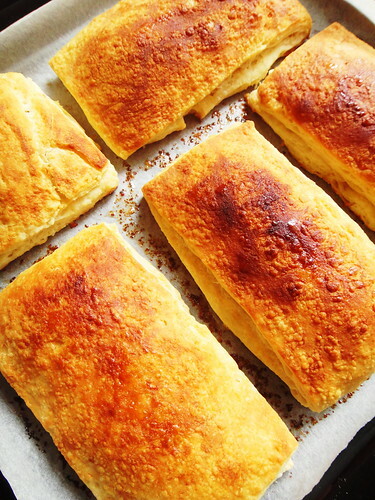 Set the pan in a draft-free area with relatively high humidity, and let the pastries rise for 2 to 3 hours. 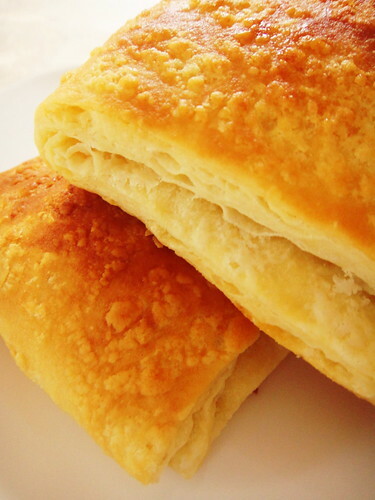 The ideal temperature is 75 °F; the temperature should not be warm enough to melt the layers of butter in the dough. Cooler is preferable and will increase the rising time and with it the flavor development. 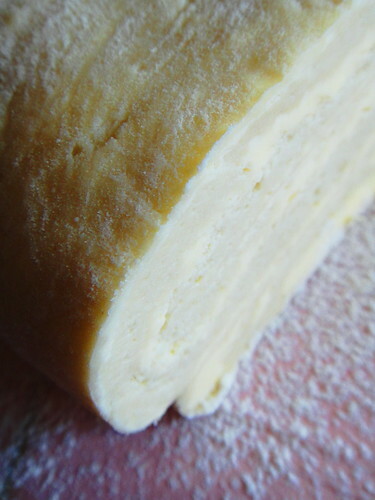 During this final rising, the feuilletés should at least double in size and look noticeably puffy. Set the oven to 425 °F to preheat for 20 to 30 minutes. About 10 minutes before baking, make the glaze. 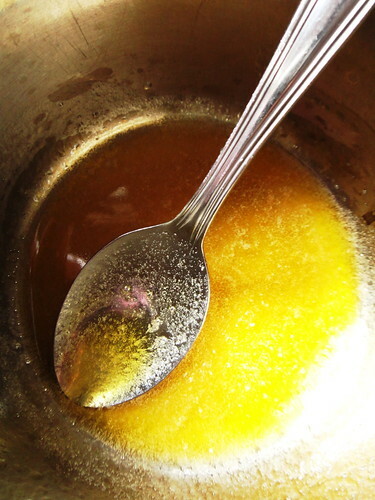 In a small bowl, combine butter and honey over low heat until you have a homogenous golden mixture. Using a pastry brush, lightly and carefully brush on the glaze being careful not to drip onto the pan. Leave it to dry slightly, about 10 minutes, before baking. 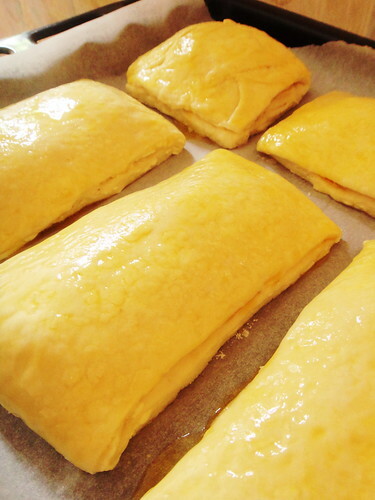 Place the feuilletés into the oven. Immediately turn down the oven temperature to 400°F, and leave the door shut for the first 10 minutes. Then working quickly, open the oven door, rotate the pan 180 degrees, and close the door. 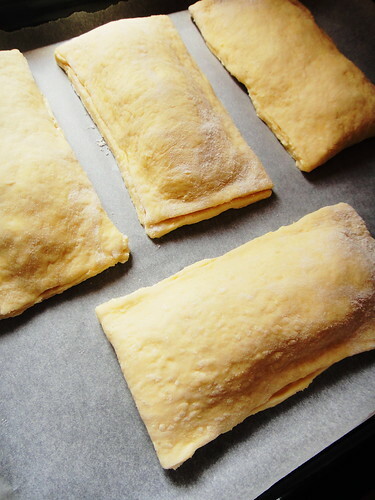 Bake for 6 to 10 minutes longer; the feuilletés should be done in 15 to 20 minutes total. They are ready when they are deep golden brown on the top, crisp on the outside and light when picked up. Remove from the oven and place them on a wire rack to cool. As they cool, their moist interiors will set up. They are best if eaten while they are still slightly warm. If they have just cooled to room temperature, they are fine as well. Or you can rewarm them in a 375°F oven for 6 to 8 minutes to recrisp them before serving. You can also store leftovers in an airtight container at room temperature for 1 day.